Andrea's World Reviews: Save Even More With Groupon Coupons! If that is not a great asset, I don't know what is. If I am looking to go somewhere or buy something, I always check Groupon first, to see if they have a deal for me. This is especially beneficial for vacations. We don't vacation often, but when we do, I expect it to be perfect. Being able to get resorts and hotels at a steal of a price on Groupon is wonderful, finding new local(to the destination) restaurants AND saving money on them is fantastic, and getting fun outings like mini golf and bowling at about half price is unbelievable cool. We can get the same vacation for half the cost, or even better, double the vacation for the same price we would otherwise pay. Groupon is just incredible. I can't even explain how much I love their deals. I was just talking about an upcoming Marilyn Manson/Smashing Pumpkins concert last week. I just found out today that Groupon has a deal for 50% off tickets. A concert I would already pay full price for, half off. It's almost too good to be true. As if all the phenomenal voucher deals were not reason enough to love Groupon, I have something even better. 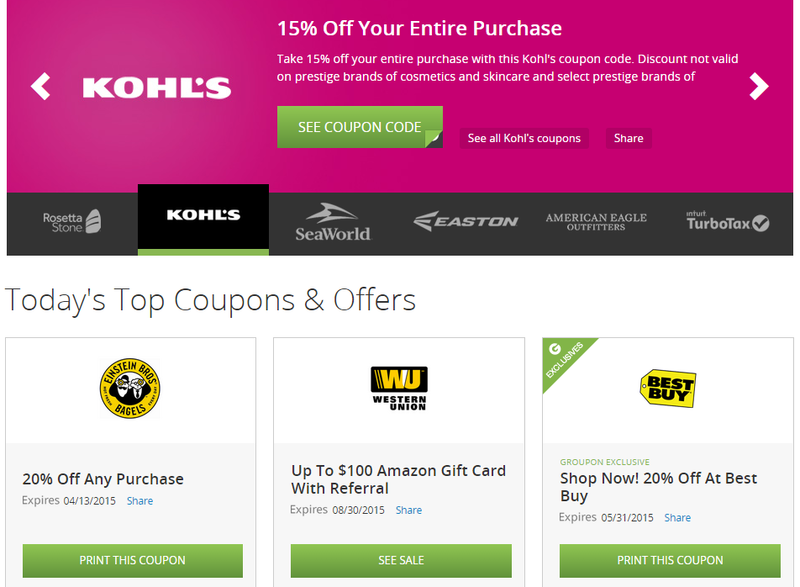 Groupon just introduced a new feature - Groupon Coupons! That's right, coupons. So now, Groupon will save you money on all the things you already buy, just like it has done before, only now you can get coupons without spending ANYTHING. Totally free coupons! Better still, these coupons are not just a few cents off or for brands/products you would never use, they are for the biggest brands around and 15% off 20% off and more. How about $20 off a Seaworld Orlando ticket? What about 67% off Omaha Steaks plus free gifts? You can get 50% off ANY Weight Watchers plan. There are way too many incredible coupons to list(over 55,000! ), but I can tell that there is something for everyone. I saw at least a dozen that I am personally going to use, and with new ones being added all the time, you'd be crazy(or foolish) not to check them out. If you want to save money, I can think of no easier way that to get free coupons for things you already plan to buy, and Groupon Coupons has the best free coupons around. I would love to hear about your experience with Groupon. What is the best deal you've ever gotten. How often do you use Groupon and have you tried Groupon Coupons yet? If not, what are you waiting for? Win a $50 Amazon Gift Card from MyIntel!! Save Even More on Luvs Diapers!